Philbrook's Boat Yard, located in the Pacific North West, takes pride in the renovation and new construction of high quality yachts since 1954. Our staff of dedicated craftsmen have expertise in the newest technologies in the industry. Repair, maintenance, renovation, design, construction. 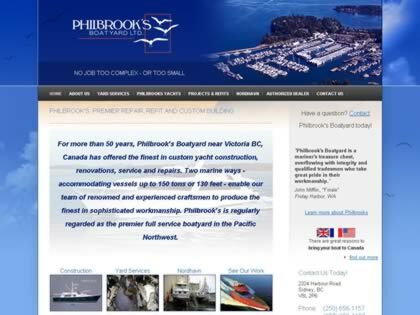 Web Site Snapshot: If available, above is a snapshot of the Philbrook's Boatyard web site at http://www.philbrooks.com/ as it appeared when this site was added to the directory or last verified. Please Note that Boat Design Net has no involvement with the above web site; all content and images depicted in the above thumbnail are the property and copyright of Philbrook's Boatyard unless otherwise noted on that site. Description: Philbrook's Boat Yard, located in the Pacific North West, takes pride in the renovation and new construction of high quality yachts since 1954. Our staff of dedicated craftsmen have expertise in the newest technologies in the industry. Repair, maintenance, renovation, design, construction.